Incumbent Chicago Mayor Rahm Emanuel won reelection Tuesday after defeating progressive rival Cook County Commissioner Jesus "Chuy" Garcia in a historic runoff election. Emanuel, who begins his next four-year term on May 18, won with 56 percent of the vote, according to WGN Chicago. Emanuel coasted to a much easier victory when he won his first mayoral race in 2011 following several terms in Congress, a stint as White House Chief of Staff for Barack Obama, and a brief but lucrative foray into investment banking. "To the voters: I want to thank you for putting me through my paces," Emanuel said through a hoarse voice during Tuesday night's victory speech. "I will be a better mayor because of it." Emanuel appeared humbled, striking a more conciliatory tone than the hard-charging style that had turned some voters off during his first term. Emanuel spoke to several of the issues that had galvanized Garcia's supporters, like strengthening schools, safety and job opportunities in the city and promised voters, "I hear you." "Being mayor of the city of Chicago is the greatest job I've ever had, the greatest job in the world," Emanuel said. Saying he was "humbled" and "honored" to have run for mayor, Garcia told supporters at his rally, "We didn't lose today, we tried today." Garcia added that his hope for the city is "a Chicago people want to move to not run away from." Democratic National Chair Rep. Debbie Wasserman Schultz issued a statement shortly after the race was called congratulating Emanuel on his reelection. Mayor Emanuel has made critical investments in the city’s infrastructure and public transportation, implemented universal full-day kindergarten, and helped foster a growing economy that is creating jobs. With today’s election result, it is clear that the people of Chicago support his focus on middle class economics and the direction he is taking the city. I look forward to seeing Mayor Emanuel's and the city of Chicago's continued success in the years ahead. Rahm Emanuel went into this election with every advantage—incumbency, support from the Chicago political establishment and funding from millionaires and billionaires. The fact that he was forced into an unprecedented runoff demonstrates the growing power of the progressive coalition and Chicagoans’ broad opposition to the policies of his first term. We hope that Mayor Emanuel is sincere when he says he'll listen more to Chicago's communities in his second term. The progressive coalition that rallied behind Chuy García is not going away, and we will continue to hold Mayor Emanuel accountable in his second term. Tuesday’s runoff election marked a first for Chicago: an incumbent mayor had not been forced into a runoff since the city made the race non-partisan in 1995. Unpopular moves like the decision to shut down 50 public schools in mostly poor black and Latino neighborhoods and the installation of red light cameras coupled with frustrations over gun violence dogged Emanuel in the initial February 26 election. Emanuel ultimately secured 46 percent of the vote, falling short of the 50 percent plus one vote needed to avoid the runoff. Garcia earned 36 percent of the vote in a field with five total candidates. 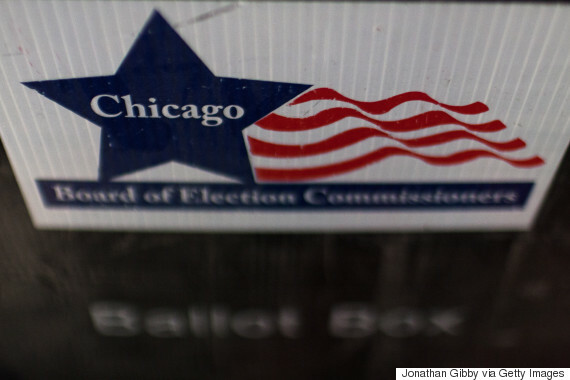 For the runoff, Chicagoans voted early and absentee in record numbers. According to the Chicago Sun-Times, more than 143,000 early ballots were cast, marking a massive increase over both the first-round election in February and the previous mayoral contest in 2011. The surge in early voting, which may be due in park to having taken place during Chicago Public Schools’ spring break, appeared to provide an early edge to Emanuel. A map of early and absentee voting data by Tom Ogorzalek, a political science professor at Northwestern University, showed that many of the wards reporting heavy participation in early voting were also Emanuel strongholds in the first-round election. Polling and fundraising numbers ahead of the race also indicated an Emanuel win in the runoff, though some questioned whether young and Latino voters, who were expected to favor Garcia, were under-represented in polling. 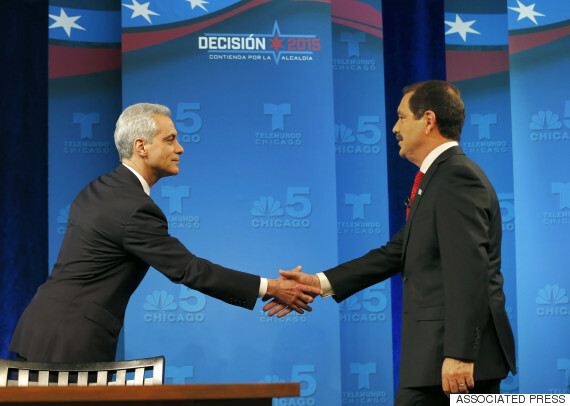 Emanuel raised nearly $23 million in the race, while Garcia's war chest was reportedly around $6 million, the Chicago Tribune reported Tuesday. The hard-fought election was seen as both a battle for the city's future and a potential harbinger for the Democratic party heading into the 2016 election. Chicago faces a host of critical issues including a looming debt crisis, underfunded city pensions, struggling public schools and staggering gun violence rates. Meanwhile, Emanuel and Garcia's differing political philosophies highlight a growing tension in the Democratic Party between candidates like Emanuel -- who are reform-minded yet friendly to big business and ultra wealthy donors -- and farther-left progressives like Garcia, whom the New York Times notes is an admirer of the policies of Elizabeth Warren and Howard Dean.